OTTAWA, Ontario, Canada, February 4, 2011 (ENS) – The Canadian Nuclear Safety Commission today announced its decision to issue a transport license and certificate to Bruce Power for the transport of 16 decommissioned steam generators to Sweden for recycling. “We always believed this was the right thing to do to reduce our environmental footprint and we are pleased the soundness of our case has been verified by the CNSC and a license has been approved,” said Duncan Hawthorne, president and CEO of Bruce Power. The license to ship the generators on the Great Lakes and St. Lawrence River will be valid for a period of one year from today. The Cities Initiative reiterated today that an accidental spill of radioactive material during shipment of the obsolete generators could exceed federal standards for radioactivity in drinking water that could trigger emergency intervention. 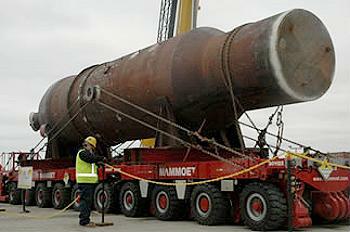 “Mayors of the Great Lakes and St. Lawrence remain concerned that this proposed shipment of 1,600 tonnes of radioactive equipment and waste from the Bruce Power facility exceeds the International Atomic Energy Agency’s own safety standard for total allowable limit of radioactive waste shipment in inland waters such as the Great Lakes and St. Lawrence,” said Mayor Denis Lapointe, of Salaberry-de-Valleyfield, Quebec, who chairs the Cities Initiative. 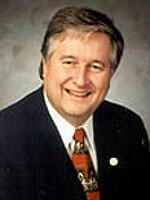 Mayor Lapointe holds a masters degree in environmental engineering. All 16 generators, each the size of school bus and weighing 100 metric tonnes, will be loaded onto one ship at Owen Sound. They ship will sail through Georgian Bay, across Lake Huron, Lake Erie and Lake Ontario, up the St. Lawrence Seaway and across the Atlantic Ocean to Studsvik harbor in Sweden. “The only difference between this shipment and the thousands of other shipments made each year is the size of these components,” says Bruce Power. Because they do not fit into the containers traditionally used for shipping low level radioactive material, Bruce Power requires a special license from the Canadian Nuclear Safety Commission. But the mayors warn that the amount of radioactive waste to be shipped exceeds by 50 times the international allowable limit for a single shipment in inland waters, potentially setting a Canadian precedent for transportation of large radioactive waste equipment that exceeds international safety standards on the Great Lakes and St. Lawrence. 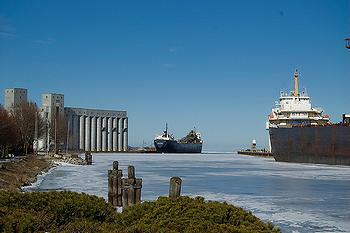 The Great Lakes and St. Lawrence form the largest body of fresh water in the world. Over 20 million Canadians and Americans live close to the shoreline of this vast basin, and over 40 million rely on them for their safe drinking water. In testimony at the federal hearing September 28 and 29, 2010 in Ottawa, and in supplementary comments to the commission, the Cities Initiative outlined its concerns over the shipment. In making its decision, the commission said it considered Bruce Power’s qualifications to carry out the proposed activities and the adequacy of the proposed measures to protect the environment, the health and safety of persons, national security and Canada’s international obligations. “The Commission is satisfied that the environmental review conducted under the Nuclear Safety and Control Act provides sufficient treatment of the potential adverse environmental impacts of the conduct of the proposed activities,” the government body said in a statement today. The commission is satisfied that Bruce Power’s application meets the international regulations of the International Atomic Energy Agency and the Canadian requirements of the Packaging and Transport of Nuclear Substances Regulations for a special arrangement. As parts of the St. Lawrence Seaway are closed for the winter, Bruce Power has announced that the transport of the radioactive waste will be delayed until the Seaway is reopened in spring. Public opinion in communities near Bruce Power runs in favor of the generative recycling shipment. In October 2010, Bruce Power commissioned the firm Ipsos Reid to conduct a survey in Bruce and Grey counties on nuclear energy generally and Bruce Power’s refurbishing and recycling plans. The survery found that 87 Percent of Bruce/Grey residents support recycling steam generators. A strong majority of Bruce/Grey residents polled support nuclear power – 75 percent overall, 33 percent strongly. Click here for a complete record of the CNSC decision and public hearing.